In Hong Kong, the Hospital Authority has been setting up Chinese Medicine Centre for Training and Research (CMCTRs) since 2003 for delivering alternative health services, to complement Western Medicine services. 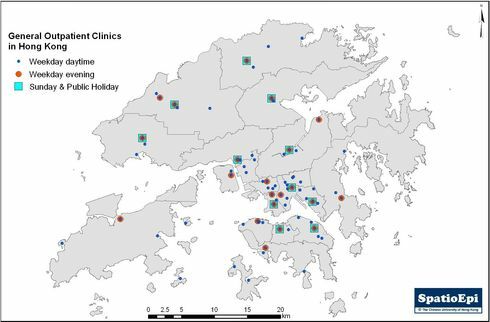 This map shows the distribution of Chinese Medicine (CM) Centres in Hong Kong. As depicted by brown cross symbols, a total of 16 CMCTRs in tripartite collaboration mode with non-government organizations and local universities are now in operation covering each of the 18 districts, except Islands and Yau Tsim Mong. There are also four CM Centres in bilateral mode of collaboration, shown by the orange cross symbols, which are located in urban Kowloon and Hong Kong Island. All CM Centres open six days a week and close on Sunday and public holiday. Data for the map were obtained from Hospital Authority. Traditional Chinese medicine (TCM) originated in China thousands of years ago. Different from Western medicine concepts, TCM is founded on philosophy of Taoism, viewing the world and the human body in a unique way. Key components of the theoretical framework of TCM include Yin-yang theory, meridians and qi, the theory of five elements and eight principles for categorization of symptoms and conditions. The most common treatments used by TCM practitioners include herbal remedies and acupuncture. Other TCM practices include massage, cupping and mind-body therapy. Although TCM has been widely used over the years, scientific evidence of its effectiveness, for the most part, is limited.